On June 1, 2001, I was waiting in Galle, for Colonel Srilal Fernando, Colonel Sunil Somaweera and some other officers from, Sri Lanka Army Medical Corps (Volunteers) to arrive in order to travel to Deniyaya to attend a funeral. My father asked me whose funeral it was. I replied that it was a funeral of a wife of one of the officers from our Battalion who himself died a long time ago. To shorten the conversation and to justify the extended arrangements for the funeral, I remarked "He is an officer who has done some great deeds for our country" and naturally father asked for his name. When I mentioned" Lieutenant Colonel Rex De Costa" my father burst in to laughter. Then he said "He has given his life for your country, you sounded as if he could have given things more valuable than that". I believe if there was any way of doing it, Lieutenant Colonel Costa would have given more than his life for our country. Anthony St. Clare Rex de Costa was born on June 15 1920 to a respectable and wealthy family. His father Marceline de Costa was a doctor from Colombo and mother Lilia De Costa was from Deniyaya Rajapaksha family who owned Deniyaya Estate. After attending Royal College, young Rex entered the Faculty of Medicine, University of Colombo. He and his brother Malcolm joined Ceylon Army Medical Corps and Royal Ceylon Navy respectively as young volunteer officers (Lieutenant Costa was mobilized in 1944 and saw action in World War II. He married his cousin Doreen (nee Gunathilake) in 1944 and the couple was blessed with four children Marcel, Cheryl, Rex and Eric. With the Dawn of Independence, Ceylon Medical Corps (Volunteers) and its parent body Ceylon Volunteer Force were formed around their colonial predecessors and there were much changes to be done to make them more 'Lankan'. Rex De Costa, then a Major, made valuable contributions to the improvements of these military institutions in their embryonic stage. He was both an excellent soldier as well as an exemplary doctor. Major Costa was known as a stickler for discipline. He possessed quiet efficiency, unassuming nature and shunning of publicity-all whole marks of a good public servant. Yet, his dashing personality, wide connections, generosity and popular nature earned him a place in all strata of Ceylonese society, earning envy of some. In 1954 he obtained a unit transfer and joined Home Guard (Infantry) Battalion which he later commanded as a Lieutenant Colonel. These battalions were nicknamed "Sir John's Bodyguard" due to attention and affection they received from then Prime Minister Sir John Kotelawala, who himself was a former Volunteer Officer in the Army. In 1956 his battalion was discontinued. An appeal by Lieutenant Colonel Costa to return to Ceylon Medical Corps was turned down and he was compelled to retire from the institution he loved most. He was only 36 years old and was one of the youngest Lt. Colonels in the Ceylon Army at the time. This setback did not hamper the spirit of this selfless human being for long. He took up the cause of the down and out World War II veterans scattered across the world and joined World War Veterans Federation. This is a giant international body with its headquarters at United Nations Building in New York. He worked tirelessly attending to the welfare needs of War Veterans and was particularly involved in providing housing facilities for them. He travelled widely across countries such as Mexico, Pakistan and Philippines in his work. Major general Lalin Fernando (Retired) who met Lieutenant Colonel Costa at an official military function in Pakistan remember him as a towering personality to whom everyone listened attentively whenever he talked. 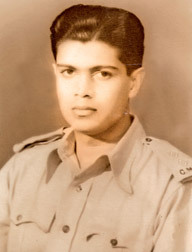 Lieutenant Colonel Costa was the Vice President of World War Veterans Federation from 1961 to 1963, a unique honour for a country like Ceylon considering its size and times. He was awarded an MBE (Member of the British Empire) a coveted decoration awarded by the Queen of England for his meritorious services. He had accomplished much for himself and the society achieving local and international fame before even 45 years of age. After a successful tenure in the above post he wanted to have a quieter life while educating his children. The family returned to their home in Deniyaya in 1967. Lieutenant Colonel Costa started a private medical practice in Deniyaya Town, more as a service for the poor than a source of income. He was an asset to the area where qualified medical practitioners were difficult to find. He was attended to family tea estates and had a relaxed but active social life. However his Country was changing fast. The new government which came to power in 1970 had to take some hard decisions to make Ceylon truly independent and prosperous. When Lieutenant Colonel Costa's daughter Marcel expressed her concerns about how anticipated land reforms act and tax increases are going to affect their future, father's reply was typical for his character as a citizen extraordinary. He said "Whatever the government asks, you have to give". Full scale rebellion erupted on April 5, 1971 taking the government and the people by surprise. It was a politico-military equivalent of a Tsunami situation. Deniyaya, a town in the hills with narrow winding access roads were immediately cut off and insurgents laid siege on Deniyaya Police Station and surrounding area which included 'De Costa' residence. All communications with the outside world were cut and even the police radios were out of order. The Police although proficient in peaceful law enforcement were not mentally, physically or technically prepared to fight battles. Realising this Lieutenant Colonel Costa, most probably the only man in the besieged town with military experience, immediately offered his services to make Deniyaya Police battle ready. This offer was gladly accepted by the Inspector of Police. Costa trained policemen on effective use of new submachine guns and also taught them basic military tactics. Lookouts and protected firing positions were organized. Lieutenant Colonel Costa took the malfunctioning police transmitters home with the intension of repairing them. Thanks to these measures Police managed to fend off initial attacks by insurgents. All these events were carefully watched by insurgent spies in the town and some of their members already in the police cell. They also observed that kind doctor they knew, is now wearing a military hat. Lieutenant Colonel has volunteered out of his enforced retirement to save his Country in its hour of need. He disregarded the fact that he, a popular doctor, responsible for a young family (Marcel was down with Chicken Pox at the time) could have easily escaped harm by insurgents even if they capture the town. He was conscious that his current actions have placed all his immediate family in danger. By April 8, position of police was becoming untenable in the face of determined insurgent attack and inspector of Police decided to withdraw to Rakwana. He requested Lieutenant Colonel Costa to join them. However Lieutenant Colonel declined saying that he can't afford the hazardous journey with his young family. Rest is history. Insurgents entered unmanned Police Station and released prisoners who briefed their comrades about the role Lieutenant Colonel Costa played in the successful defence of the police previously. The angry insurgent unit went to his house about 9 am on April 9 and demanded him to come out. As he came out from front door with hands raised, gesturing surrender, he was cut down by a hail of bullets. Lieutenant Colonel died instantly. His death was mourned by many in Ceylon and abroad including some of the insurgents. One of the ex-servicemen James Ponweera wrote of him "died under sad and tragic circumstances to protect Our Nation's Democratic Socialism". The event became one of the bloody highlights of the 1971 insurrection. Justice AC Alles has dedicated an entire chapter in his book about the insurrection to De Costa Murder'. De Costa family continued to live in Deniyaya for few years before they moved in to Colombo. They still maintain their house in Deniyaya and marks made by bullets which killed the Lieutenant Colonel are still preserved. The family continued their charitable work for needy in Deniyaya area for years thereafter. Although devoted Christians, they were noted for their involvement in religious and welfare activities of all religious groups. Their generosity even extended to people who had a hand in the events which killed Lieutenant Colonel Costa. Mrs Doreen De Costa was affectionately known as "Sudu Amma" by poor villagers in the area whom she helped. The family also maintained links with Lieutenant Colonel Costa's former unit, Sri Lanka Army Medical Corps (Volunteers) where his photograph is displayed and spirit prevails. Lieutenant Colonel Rex De Costa is a man one could say had everything to live for. He loved and toiled tirelessly for his country and humanity without getting much in return, to say the least. He may have had many disappointments and disagreements with the system up to his last days. When his Country's interests were in peril at an unexpected moment and he was the only man who had the capacity to help. Lieutenant Colonel Costa voluntarily, selflessly and gallantly stood up to defend the system and gave it everything he had including his life. He was just the opposite of those who due to various ideological beliefs, personal benefits, actual or perceived injustices, jealousies or other petty issues, proceeded to avoid their higher responsibilities as citizens and even use such excuses to commit harmful acts against their motherland. "Do not ask what country can give you; ask what you can give the country".